University of Nebraska Press, 9780803235755, 399pp. In 1715 the upstart British colony of South Carolina was nearly destroyed in an unexpected conflict with many of its Indian neighbors, most notably the Yamasees, a group whose sovereignty had become increasingly threatened. The South Carolina militia retaliated repeatedly until, by 1717, the Yamasees were nearly annihilated, and their survivors fled to Spanish Florida. The war not only sent shock waves throughout South Carolina's government, economy, and society, but also had a profound impact on colonial and Indian cultures from the Atlantic Coast to the Mississippi River. 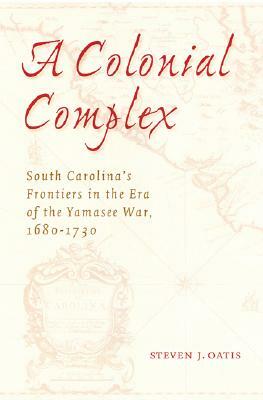 Drawing on a diverse range of colonial records, A Colonial Complex builds on recent developments in frontier history and depicts the Yamasee War as part of a colonial complex: a broad pattern of exchange that linked the Southeast’s Indian, African, and European cultures throughout the late seventeenth and early eighteenth centuries. In the first detailed study of this crucial conflict, Steven J. Oatis shows the effects of South Carolina’s aggressive imperial expansion on the issues of frontier trade, combat, and diplomacy, viewing them not only from the perspective of English South Carolinians but also from that of the societies that dealt with the South Carolinians both directly and indirectly. Readers will find new information on the deerskin trade, the Indian slave trade, imperial rivalry, frontier military strategy, and the major transformations in the cultural landscape of the early colonial Southeast. Steven J. Oatis is an assistant professor of history at the University of the Ozarks.